KYBELLA (deocycholic acid) is an FDA-approved injectable treatment which gradually dissolves the unwanted fat from the area just under your chin, called the submental region. Now, without surgery, this injectable office treatment for the double chin area can permanently destroy treated fat cells with 2 to 4 treatments, spaced a month apart. Dr. Edward Szachowicz performs KYBELLA injections in Edina to help Minneapolis-St. Paul residents treat fat under the chin that can be genetic, associated with weight gain or aging and is often resistant to both diet and exercise. As KYBELLA is injected into the fat of the double chin area, there is immediate disruption of the fat cells with release of the fat into the surrounding tissues. Over the next days and weeks, the body will remove the unwanted fat during the healing phase. Once the fat cells are destroyed, those cells cannot accumulate fat again. KYBELLA is a bile acid that is naturally present in your body and used to breakdown fats for digestion. When treating a double chin, KYBELLA is precisely injected into the excess submental fat which causes the permanent destruction of those fat cells. The good news is those fat cells treated with KYBELLA can no longer store or accumulate fat. KYBELLA is for people who have fat below the chin line causing a “double chin” appearance. The accumulation of fat occurs in both men and women, and can be genetic, associated with weight gain or aging. Kybella treats the only the superficial fat that accumulates between the skin and the underlying muscle. At your consultation, Dr. Szachowicz will feel for the submental fat during your examination and inform you whether Kybella is a good choice for you. During your consultation in the office, Dr. Szachowicz will examine the area under your chin to determine the area of fat accumulation. KYBELLA is for the superficial fat which lies just beneath the skin. Before your KYBELLA injections, you should stop all blood thinners such as aspirin, NSAIDs such as (ibuprofen, Aleve, Motrin, etc. ), and fish/plant oils for at least one week prior to treatment. 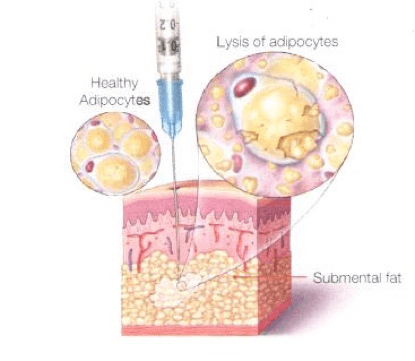 An injectable numbing agent is placed into the fat of the treatments area. The “area of treatment” is marked and a skin marking grid is applied to the area of fat treatment under the chin. Multiple injections of KYBELLA are placed in the superficial fat just below the skin (usually 2 to 3 vials of KYBELLA). After injection, ice is applied to reduce discomfort and swelling. 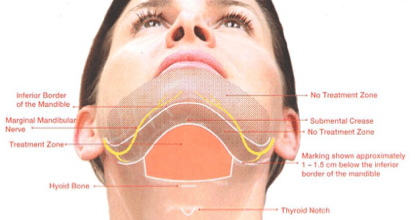 A dot matrix grid is placed over the treatment area of fat under the chin. The number of dots in the treatment zone determines the number of vials of KYBELLA which will be required for your treatment. The treatment zone is below the pathway of the marginal mandibular nerves, which need to be avoided during your treatment. Pain/tenderness – this is caused by the immediate disruption of the fat cells. Swelling – the fat which is released within the destroyed fat cells is absorbed by your own body by the process of inflammation, the swelling is the beginning of this process. Most of the swelling resolves within 2 to 4 days. 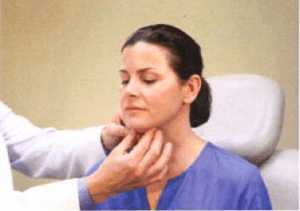 Bruising – with multiple injections spaced over the double chin area, some bruising is normal. Redness – the treatment area heals by inflammation; redness is most prominent in the first few days. Numbness – there will be temporary numbness in the treatment area for the duration of treatment, which then resolves. Stiffness – as the swelling resolves, it is replaced with a tissue stiffness that remains until most of the fat is absorbed by your body – usually 3 to 4 weeks. For most people, the most reactive times of treatment are after the first or second treatment with KYBELLA. Most people begin to see visible results in the contour of their neck after the second treatment. The average number of KYBELLA treatments in the submental regions is 2 to 4. Most people reported that treatment reactions as mild to moderate. The marginal mandibular nerve to the lower lip is near the treatment area for submental fullness. Weakness or paralysis of the nerve which lowers the lower lip can occur, but has returned in function in all the study participants. If weakness occurs, it is usually immediate and may last for weeks to months. There is a risk to skin (skin loss) or loss of beard hairs in men. There may be injury to tissues and structures near or within the treatment area such as salivary glands, lymph nodes and muscles. 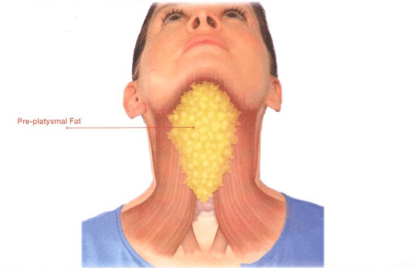 KYBELLA is not indicated in patients with bleeding abnormalities, dysphagia or history of facial nerve dysfunction. Adverse reactions which lasted more than 30 days or beyond the end of the study included: injection site numbness, injection site swelling and stiffness, injection site pain, itching or skin discoloration. To learn more about KYBELLA fat injections to contour your chin profile, request a complimentary consultation with Dr. Szachowicz at Facial Plastic Surgery in Edina, MN, or call (952) 835-5665 for an appointment.